This antique light golden pilsner won a gold medal at the 2017 Alabama Craft Beer Championship, and got 2nd place best beer of the competition! This is the second year in a row that it has medaled at this competition. 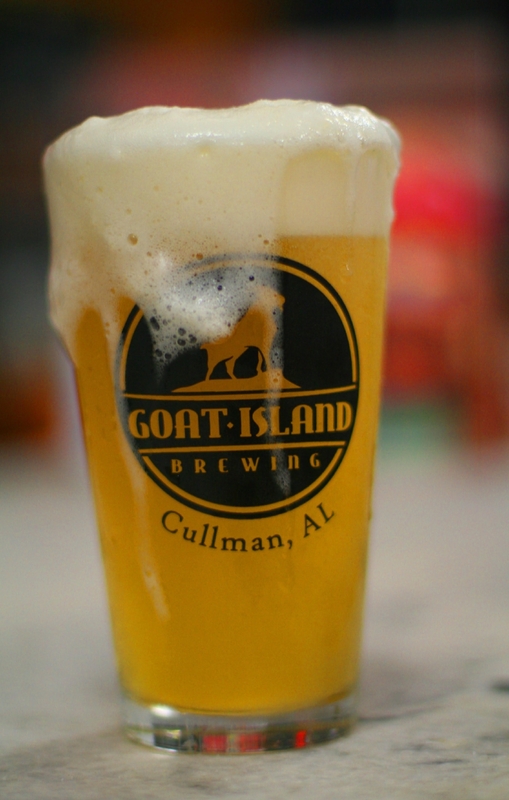 This delicious beer is influenced by German and American traditions, much like the German immigrants that founded Cullman, Alabama in the late 1800’s. A local merchant found a hand written beer recipe in the attic of his old downtown building in Cullman. The recipe turned out to be from William Frederick Richter, owner of Richter’s Saloon in the late 1800’s. It has a great grainy malt flavor from the German Pilsner malt, and a clean hop bitterness from the German hops and the lagering process. This is Goat Island Brewing’s flagship beer. The first thing you’ll notice about this beer is an intense burst of hop flavor and aroma. Although there is no fruit added to this beer, you may recognize hints of citrus zest, mango and apricot. The next pleasant surprise is the absence of an overly bitter aftertaste. There is also a nice malty backbone to this IPA that gives it great balance. When you taste this beer, you’ll see why many people say it is the best IPA they have ever encountered. This beer won a gold medal in the 2016 Alabama Craft Beer Championship, and a bronze in the 2017 competition. It is an amber to red ale with the perfect balance between malt and European hops. It is smooth, flavorful and colorful. The one thing that sets it apart from other red ales is the fragrance. It will remind you of walking through the Sipsey River Wilderness area in the spring. This Bavarian style March beer got a bronze medal in the 2017 Alabama Craft Beer Competition. It is copper to gold, very malty and full of flavor. Ample helpings of Munich malt give it it’s distinctive toasted malt background. The rest of the malt bill is designed to give it that wonderful body and a hint of sweetness. Did we mention that it is a malty beer. It’s very malty! The hop profile is very mild to, you guessed it, allow the malts to shine through. Fermenting with a german lager yeast strain leaves this beer with a clean drinkable taste. Enjoy! One drink of this hazy, golden wheat beer and you’ll find yourself back in the sixties. The german heffeweizen yeast used to ferment this beer give it a smooth groovy flavor with hints of fresh bread and the faint aroma of banana. It is light and refreshing. The perfect beer for our hot Alabama weather. Bring on the summer of I love this beer. Far out! This complex imperial porter is dark, decadent and delicious, but it is not a heavy beer. It is lighter in body than you would think and has a nice malty background. It pours a clear but dark brown. As you drink it a nice vanilla aroma mixes with the taste of caramel, chocolate and coffee. It is surprisingly drinkable for such a complex higher ABV beer. This gorgeous orange-to-pink beer is refreshing and drinkable. A lush sweet orange aroma hits you as you take your first drink. Then, that well crafted wheat ale backbone shines through. Go ahead and indulge yourself - you deserve it!